Stephanie Hornbeck, former Chief Conservator for the Smithsonian Institution Haiti Cultural Recovery Project and current Director of Conservation at Caryatid Conservation Services, appeals to culture sector colleagues in Haiti to "actively continue with the conservation of their cultural heritage—today, not tomorrow." ABOVE: Conservation assistant God-Freed Enoy and Cooper-Hewitt, National Design Museum registrar Bethany Romanowsky catalogue ceramics in Marianne Lehmann's important collection of Haitian Vodou Art. Smithsonian Institution Haiti Cultural Recovery Project. I served as Chief Conservator for the Smithsonian Institution Haiti Cultural Recovery Project in Port-au-Prince, Haiti, from 2010-2012, directing conservation recovery efforts of cultural patrimony damaged in the January 2010 earthquake. I am currently Director of Conservation at Caryatid Conservation Services, Inc., a private practice in object and sculpture conservation based in Miami, FL. 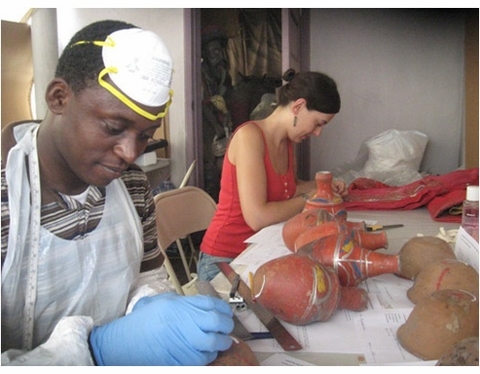 The Smithsonian Institution Haiti Cultural Recovery Project was formed to provide conservation expertise and training in cultural recovery operations over an 18-month period, from June 2010 –December 2011, after Haiti's devastating earthquake. From the outset, the project was envisioned as important to laying the groundwork for future conservation efforts to be undertaken by Haitians trained in conservation, historic preservation, and collections management (for an overview of the project, please refer to my previous blog, Building A Foundation For Preservation). Operating from a rented Cultural Recovery Center in Port-au-Prince, we aided 20 public and private institutions. So much work remains. This essay presents recommendations and offers an appeal to culture sector colleagues in Haiti to actively continue with the conservation of their cultural heritage—today, not tomorrow. Training was a crucial aspect of the Smithsonian's project; twelve Haitian conservation assistants—college graduates in art or chemistry—worked for the project. While we achieved significant results, post-disaster cultural recovery in Haiti requires an investment of years of dedication—perhaps a quarter of a century more. Trained professionals are needed to continue work on basic stabilization efforts, create inventories, and implement storage improvements—training initiatives must continue for years to come. 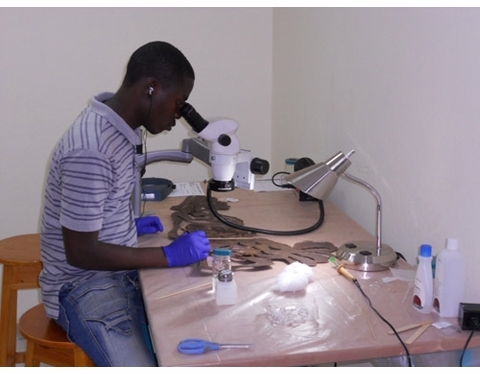 In 2012-2013, most of the conservation assistants participated in a newly created cultural heritage management program at Quiskeya University in Port-au-Prince. They now have valuable experience and training; but the formal development of an infrastructure that would support cultural heritage activities is urgently needed. 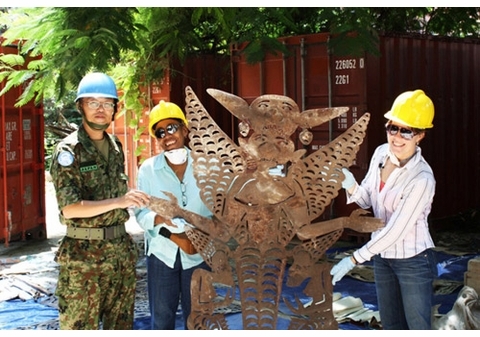 ABOVE: MINUSTAH officer (name unknown), Project Manager Marie-Lucie Vendryes, and author/Chief Conservator Stephanie Hornbeck support a recovered fer découpé sculpture on site at the collapsed Centre d'Art. Smithsonian Institution Haiti Cultural Recovery Project. ● conservation activities and projects. For the country's size and resources, a single conservation center could support conservation initiatives for the entire nation. Environmental and financial resources are defining aspects of a region that would consequently inform how a conservation program is developed in response to the country's needs and situation. Other countries similar in size, geographic conditions, and with comparable federal budgets to Haiti could be considered as templates for viable conservation programs. Conservation programs already established in the region—in the Caribbean and Latin America—which also have tropical climates and similar resources, should be studied. Cuba, Mexico, and Peru all have national conservation programs. ABOVE: Working in the object conservation studio, conservation assistant Marc Gerard Estimé treats one of over 300 fer découpé sculptures recovered by the project. Smithsonian Institution Haiti Cultural Recovery Project. Ideally, the development of conservation initiatives would be generated at the government level, likely via the Ministry of Culture. The support of Haitian cultural institutions, like museums, libraries, archives, art galleries, and foundations, is critical to creating a functioning system. These institutions would provide the projects for emerging collection managers and conservators and, in turn, would be the chief beneficiaries of formal conservation efforts. Support at the executive and board level of institutions is needed, as they provide vision and direction to institutions. To establish and run a conservation center will require funding at the outset and then a supply of ongoing revenue, most likely a hybrid financial model with private and public financing. Expenses would include building or renovating a modest facility, paying staff salaries, and meeting operational expenses, such as utilities and security. The government, perhaps via the Ministries of Culture and Tourism, could implement a tourism tax, whereby a percentage of tourism and hospitality revenue would be applied to cultural preservation. A private benefactor(s) could endow such a center. Lastly, a fee-for-service system would involve payment by institutions and private individuals on a per project basis. A guiding committee of advisors and operational plans will be needed. An interdisciplinary committee of Haitian professionals in the culture sector (representing public and private institutions) could be formed to develop a strategic plan for the new conservation center. First considerations should be the particular needs of the facilities and collections, as well as available resources (personnel, funding, supplies and equipment, etc.) of the cultural organizations there. A formal survey could assess these variables and provide data to inform a five-year strategic plan for conservation. Conservation positions will need to be created and funded to absorb the newly trained conservation professionals. As Haiti is regularly subjected to natural disasters, primarily tropical storms and hurricanes, the committee should work to develop an Emergency Response Plan template for facilities and collections. The template should be made available to private and public institutions to adapt for their specific needs. Guidelines for how to develop an emergency response plan are available online (see for example: Heritage Preservation, American Alliance of Museums, Canadian Conservation Institute). To establish a new conservation center would require a facility that conforms to basic preservation standards for housing and storing collections. This center would have as its mission the conservation, stabilization, and treatment of Haitian cultural patrimony. Ideally, the future center would be multidisciplinary and provide services to a range of cultural organizations throughout the country: in the areas of collection management, historic preservation (architecture), paintings conservation, objects/sculpture conservation, and paper/documents/book conservation. The new building must consider the use of both natural and artificial climate control measures due to issues related to a lack of continually available electricity in Haiti. Natural light and air circulation are important. Incorporating natural ventilation and fans is necessary and a practical must in Haiti. If air-conditioning is used, it is important to minimize repetitive cycling (rapid increase/decrease) of temperature and humidity over short periods of time. An existing inventory of materials, supplies, and equipment from the Smithsonian project (currently stored in Port-au-Prince) will set up the new center. Distributors of conservation-grade materials need to be contacted about the possibility of cost-effectively providing these materials in Haiti, ideally at reduced rates and with customs costs waived going forward. The development of a conservation-training model specific to Haiti's needs will best serve the country. While study abroad is an immediate option, it would take students away from Haiti, and thus away from addressing the earthquake related damage to cultural patrimony for a period of time. Student retention could also pose a problem, leaving the patrimony without future stewardship. A combination of continuing training in Haiti and offering opportunities for periodic professional internships abroad may be the solution. No formal training program yet exists at a Haitian university, so a transitional training model must be developed, with the goal of moving toward the establishment of a formal accredited training program. This model would require development of a curriculum and bringing foreign conservation instructors to Haiti periodically to teach a sequence of courses. The coursework should also continue to address the volume of earthquake damaged patrimony. Ideally, a Haitian university would host the new program and would grant certificates and eventually degrees in collections management and art conservation. Active discussion is underway to initiate collaboration with a university. In the interim, collaboration with the Rome-based ICCROM, which has a proven track record of conservation training in developing nations, could develop multi-phased, sequential training models, perhaps following the models they have developed for several African countries. An international advisory committee comprised of experienced conservation education administrators and teachers could offer guidance in developing a conservation program. Committee members may include colleagues at ICCROM, foreign graduate programs, and professional conservators, who participated as instructors at the Smithsonian's Haiti Cultural Recovery Project. An important aspect of contemporary formal conservation training involves immersion in a professional laboratory, such as at a museum or regional conservation center. To address this need, funded internship opportunities could be offered by museums abroad. The internships would need to offer a stipend for travel and living expenses, and depending on the duration, may require temporary visa sponsorship. ABOVE: Project manager Marie-Lucie Vendryes and conservation assistant Marise Desrosiers inventory and store stabilized paintings. Improving collection inventories and storage conditions are wide-spread needs in Haiti. Smithsonian Institution Haiti Cultural Recovery Project. General Recommendations for the Short Term: Start Now! ● Prioritize items in cultural collections by cultural importance: to be undertaken by internal staff at institutions. Such hierarchies help articulate conservation treatment priorities. ● Continue cataloguing collections and create inventories at institutions. ● Continue to improve basic collections care conditions, including the institution of periodic cleaning and maintenance schedules at institutions. ● Continue to implement storage improvements at institutions. ● Continue to perform detailed large conservation assessments of individual institutions to identify needs and priorities of facilities and collections. Small teams can undertake in-depth assessments at identified institutions. ● A detailed assessment should be undertaken for the Bureau National d'Ethnologie. The institution's facility and its collection are in a precarious state of preservation and in need of immediate attention. ● An assessment for the Museum of Haitian Art should be performed. Its important collection would benefit from professional conservation guidance. 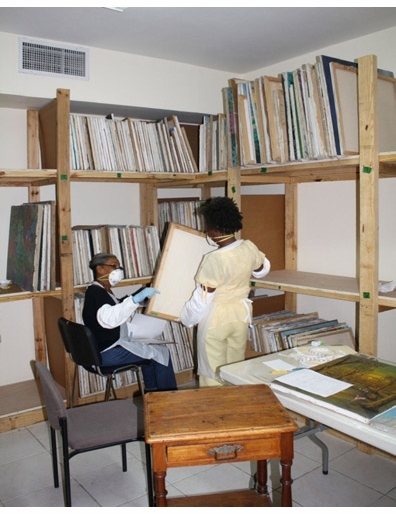 ● The Archives Nationales d'Haïti is in dire need of continued work to organize its documents and house and store them properly. The institution needs collections assistance at all levels, including training to further update practices. ● Viable, practical and effective treatment solutions to address infestation issues need to be developed to treat affected ethnographic works at the Marianne Lehmann Vodou Collection. ● A survey of audio-visual media collections indicated that only minimal archival practices were in place; significant additional work is recommended to improve the inventory records, storage, and primary care of these collections. In the spirit of self-determination—historically important to Haitian citizens—Haitian professionals at cultural institutions will need to work together to identify conservation needs and to define conservation goals specific to Haiti. Such dedicated professionals will lay the groundwork for development of Haiti's first generation of conservators. While foreign expertise will be necessary, Haitian culture-sector professionals can unite to chart their own course for the conservation of their cultural patrimony. STEPHANIE HORNBECK is Director of Conservation at Caryatid Conservation Services, Inc., a private practice in object and sculpture conservation based Miami, FL. From 2010-2012, she served as Chief Conservator for the Smithsonian Institution Haiti Cultural Recovery Project in Port-au-Prince, Haiti, directing conservation recovery efforts of cultural patrimony damaged in the January 2010 earthquake. In recognition of her service, Stephanie was awarded the Smithsonian Secretary's Gold Medal for Exceptional Service; she is the first conservator in the award's history to be so honored. From 1998-2009, Stephanie was Conservator at the Smithsonian Institution's National Museum of African Art in Washington, DC. 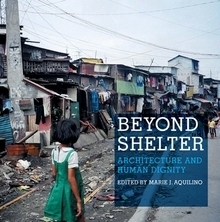 Stephanie has lectured and published on disaster salvage and recovery, issues common to ethnographic and contemporary art, and the identification and regulation of ivory. She is a Professional Associate of the American Institute for Conservation of Historic and Artistic Works (AIC). Pbk, 8 x 8 in. / 304 pgs / 300 color.